It may be the greatest story that David Jablonski has ever told. It is the story of Biological Evolution, the title of Natural Sciences 103 in the Core. 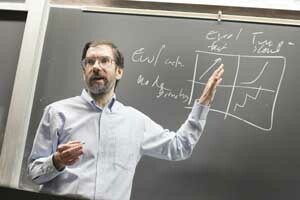 He has told the story nearly every Fall Quarter since he created the course in the late 1980s, and his way of telling it has earned him a Llewellyn John and Harriet Manchester Quantrell Award for Excellence in Undergraduate Teaching. Those are the principles that any informed adult needs to know in this era of genetic engineering and genetic profiling, antibiotic-resistant microbes and emerging infectious diseases. “The Century of Biology” has dawned, Jablonski said. “I think it’s essential that every citizen, every voter, has enough background in biology to be able to think critically about the kinds of questions they’re going to be confronted with in the next decade,” he said. Another of Jablonski’s goals is to convey his passion for science to his students. He wants them to see how each of his own discoveries or analyses opens doors to asking exciting new questions. “That’s a different message about science than you sometimes get by opening a 700-page introductory textbook. That sort of feels like everything’s done,” he said. Jablonski loves teaching NatSci 103, he says, because “it lets me reach beyond my usual scientific audiences, it forces me to keep up with fields way outside my own specialty and students are great. I’ve had students jump ahead of me in the course—for example, working out, on the spot, the possibility of species selection, where natural selection operates at the species level instead of just on individual bodies. They’ve worked out some of the stranger implications of mimicry, in which one species evolves to resemble another. “These are students who don’t have a strong science background, but they can think, and they are constantly delighting me and surprising me by what they do,” he said. Jablonski also had praise for his teaching assistants, who help grade exams and handle the laboratory and discussion section of the course. He has, in fact, made it a course tradition for his teaching assistants to devote a large part of one laboratory session to a discussion of their Ph.D. research. The tradition came about by accident when Conrad Labandeira (Ph.D.,’90) served as a teaching assistant. Labandeira now is curator of paleoentomology at the Smithsonian Institution. Labandeira had brought his slides to his laboratory session because he was going directly from there to a meeting presentation. The students asked Labandeira to show the slides, and so he did. The result was a spontaneous and wide-ranging discussion of his research and why he was doing it. “He got such great feedback, and the students were so enthusiastic that I said, OK, let’s just add this to the lab schedule so that every TA gets a chance to do it and students get to hear from researchers who are just getting launched on their careers,” Jablonski said.